What is the purpose of the Recycling Flip Top Bins? Recycling Flip Top Bins are general-use recycling bins with a 50 litre capacity. They are available in several different colours and have stickers indicating type of waste are available at no extra charge. The flip top construction combined with plastic construction makes this a hygienic choice of waste bin. These flip top bins can be used anywhere where recyclable or non-recyclable waste is produced. This includes schools, parks, community centres, and workplaces, among others. Their tough design makes these bins ideal for outdoor use, in areas such as parks or playgrounds. Their small size and bright colouring makes these bins ideal for use with children, in places such as schools, day care centres, and churches. Anyone and everyone might use this product to deposit their recyclable waste. Parkgoers, students, restaurant customers, and many others might use this product. For that reason, the proprietors of such spaces might be interested in buying flip top bins. Because are easy to use, easy to clean, and environmentally friendly, anyone who buys Recycling Flip Top Bins will certainly be pleased with the results. 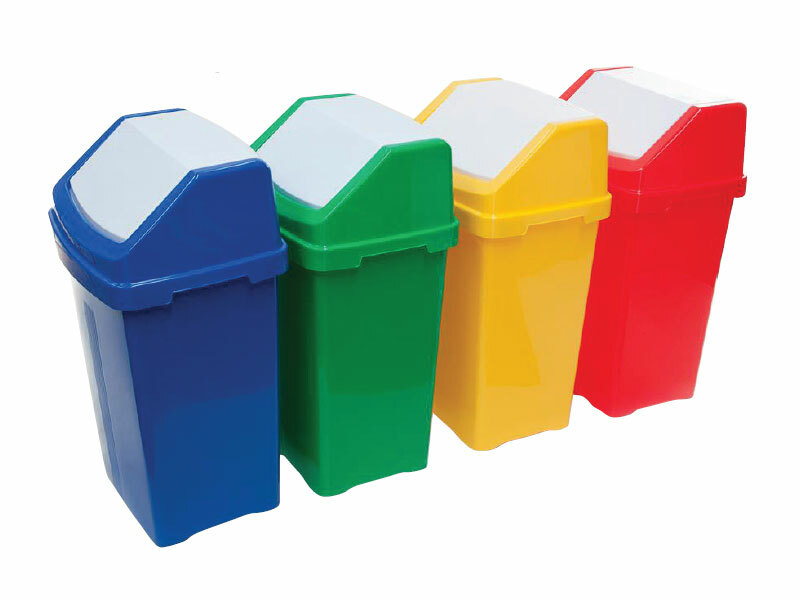 Furthermore, these bins are available in several colours, so they can be used within a colour-coded recycling system. 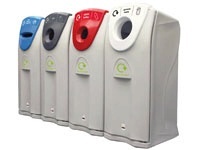 School administrators might purchase these recycling bins for their cafeterias or hallways. Business owners might place them in employee break rooms. Local governments might use these flip top bins in parks, and in other public areas. The possibilities for who might use these versatile bins are endless. Whoever purchases these bins will be pleased with how easy to use and clean they are. All plastic flip top bins. Available body colours include: Red, Yellow, Green and Blue. Includes a white flip-top lid. Use for recycling or general waste. 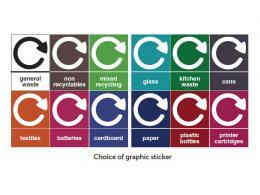 Choice of free stickers: general waste, non-recyclables, mixed recycling, textiles, batteries, cardboard, glass, kitchen waste, cans, paper, plastic bottles, and printer cartridges. Dimensions (H x W x D – mm): 665 x 330 x 400.